Darwin Dietitians now has the latest in body composition analysis with the InBody 720 Composition Analyser. This amazing piece of technology is one of only 6 in Australia and the only one of its kind in the Northern Territory. Most people have heard of these two terms, but few really understand what they mean or how they are interpreted. BMI is your weight (kg) divided by your height to give you a score of kilos per metres2. BMI is used to approximate obesity levels. However, in order to have an accurate obesity judgment, percent body fat must be considered. Your Body Fat percentage is the percentage amount of your body that is fat. Consider the two men below. Even though their BMI is almost the same, their obesity levels are greatly different. 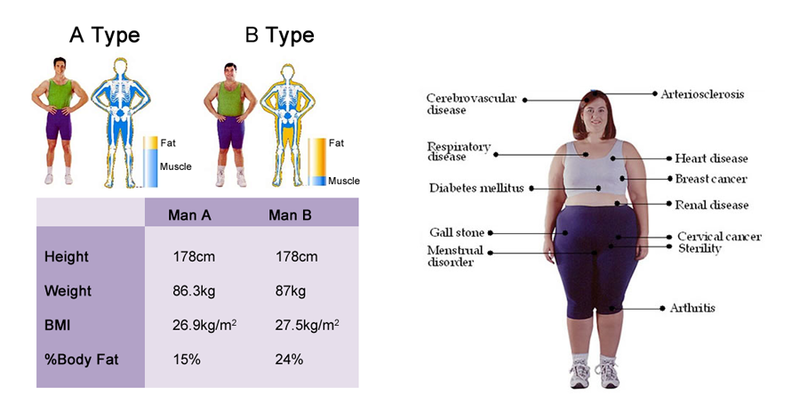 Man A has a greater muscle content whereas Man B has more fat. In order to provide the best nutritional advice, both scores need to be taken into consideration and Darwin Dietitians is able to accurately measure both. High Visceral fat scores put you at a higher risk of developing a number of serious chronic diseases that decrease your life span as well as your quality of life. To make an enquiry or booking, please fill out this contact form.